The Montessori Children's House of Hyde Park appreciates your interest in providing the best possible learning environment for your child. We take great pride in our credentials, the excellence of our staff, and the quality of our curriculum. It is our goal to provide every child with an education for life. The Montessori Children's House of Hyde Park been part of the Tampa community for over 20 years and has a deep-rooted commitment to excellence. We serve children ages 3 to 12, in three multi-aged classrooms, and it is our goal to provide every child with an education for life. Dr. Montessori saw her educational approach as one which should be universally accessed. "Montessori" is not a trademark because she did not patent her name. Due to this fact, any institution can to claim to offer a Montessori education. A.M.I. is the only association officially approved by Dr. Maria Montessori to continue her legacy. To be considered for A.M.I. recognition, a school must undergo a rigorous credentialing process. This insures that each A.M.I. accredited institution adheres to and maintains the highest standards for Montessori education. The Montessori Children’s House of Hyde Park is proud to be one of only 5 A.M.I. institutions in the entire state of Florida. The closest A.M.I. school to Hyde Park is located in Clermont, FL, 75 miles away. For further details on A.M.I., click here. 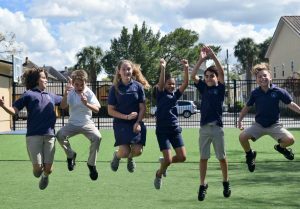 The Montessori Children's House of Hyde Park is proud to be accredited by the Florida Council of Independent Schools (F.C.I.S.). Founded in 1954, F.C.I.S. is the premier accrediting body for independent schools in Florida. This council promotes the highest standards for PK-12 education through its accreditation process, professional development program, and advocacy efforts. 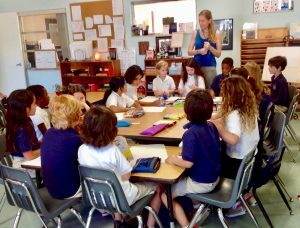 It is one of only 10 state associations in the U.S. whose accreditation process has been recognized by the National Association of Independent Schools (N.A.I.S.). The N.A.I.S. is the international authority on independent school accreditation representing schools in over 100 countries. The Montessori Children’s House of Hyde Park is the only A.M.I. 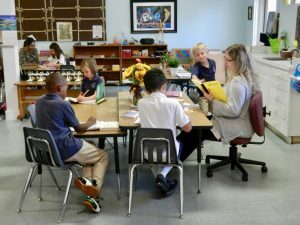 school in Tampa and the only school in Florida that is accredited by both A.M.I. and F.C.I.S. "Better than a thousand days of diligent study is one day with a great teacher". At the Montessori Children's House of Hyde Park we are committed to Educational Excellence at every level. Each of our class Directress' and our Director of Education is A.M.I. Montessori trained. The average tenure of our three classroom Directress’ is over 10 years. Our Director of Education has been with us over 15 years and our Head of School has been with us over 20 years! "Education is not the training of facts, but the training of the mind to think"
We want to see each student succeed and grow to meet their potential; To ensure that each student is a good fit for the Montessori method, we perform student screenings and interview prospective parents. At our school, we offer an A.M.I. Montessori education for children ages 3 through 12, where the foundation for life occurs. Our school provides each child with an "Education for life". After completing our program, every student emerges an independent critical thinker, adaptable, and with a love for learning. Our A.M.I. Montessori prepared environment is designed to meet each child's individual needs. The mixed-age classrooms enable older children to role-model for the younger ones. The younger students, as they observe their older peers, are inspired to more advanced work and social skills. This model is specifically designed to allow each child work at his or her own pace. As part of the curriculum, we also conduct field trips and overnight camps. Additionally, we offer several after school clubs (Drama, Chess, Soccer, Art), as well as extended hours care for your convenience.